The Congressional Budget Office has issued its much-anticipated assessment of the coverage and financing implications of the American Health Care Act as passed by the U.S. House of Representatives. It projects that enactment of the legislation would increase the number of uninsured Americans by 23 million throughout the next decade. CBO also projects that the legislation would reduce the federal deficit by $119 billion during the next decade. Medicaid spending would be lessened by $834 billion from 2017 to 2026. MHA President and CEO, Herb B. Kuhn, released the following statement regarding President Trump’s proposed budget that was released yesterday. “The budget proposal released by President Trump would eviscerate the health care safety net for many poor and low-income Americans. It would shift costs to states like Missouri that are already struggling to fund Medicaid. When combined with the health care legislation being considered in Congress, the budget would further expand the inequity between states that have and have not expanded Medicaid through the Affordable Care Act. The budget decreases investments in the health care workforce at a time when additional, rather than fewer, health care professionals will be needed. And, the proposal would jeopardize children’s health by reducing eligibility for enrollment in the Children’s Health Insurance Program and the incentives for states to participate. Blue Cross and Blue Shield of Kansas City announced that they are withdrawing participation in the 2018 individual marketplace. 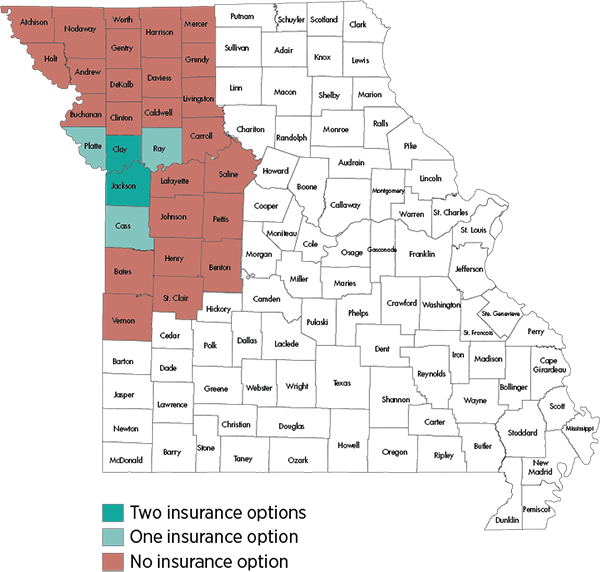 Unless another insurer enters the individual marketplace, 25 western counties in Missouri will be left without any insurers. Thirty counties in Missouri and two counties in Kansas City, amounting to 67,000 Blue KC members, will be affected. MHA has prepared a visual of the affected counties in Missouri (map pictured). MHA has submitted a comment letter expressing support for the Centers for Medicare & Medicaid Services’ proposed transition to the use of Worksheet S-10 in distributing Medicare disproportionate share hospital payments. CMS included this initiative in its proposed regulatory changes for the Medicare inpatient PPS for fiscal year 2018. MHA has promoted the change in its legislative and regulatory advocacy. The current formula for distributing Medicare DSH payments relies on a flawed metric that disadvantages states, such as Missouri, that chose not to expand Medicaid eligibility as authorized by federal law. If finalized by CMS, the change would increase Medicare DSH payments to Missouri hospitals by $34 million. MO HealthNet has posted its 2017 managed care provider training presentation online. Visit MHA’s website for additional Medicaid managed care resources. The Centers for Medicare & Medicaid Services has updated the known issues documents associated with the inpatient quality reporting and electronic health record programs. The documents have been updated with issue resolutions and newly identified issues, and are available on QualityNet. One in 5 adults in America experience a mental illness. That’s 43.8 million per year.